The ability to analyze and understand business data to predict customer and competitor behaviors through an infinite amount of unorganized data is going to be a baseline expectation in 2016 and beyond. The skills needed to synthesize data from the business ecosystem, quickly and make important business decisions are going to be critical. Think of these skills needed in the following way; you are a business person going to an important meeting. You get into your car and plug the address into your GPS. As you are on your way, the system knows there is an accident on your route and takes you a different way. Back on the job, the situation is going to be similar. Financial Acumen skills such as understanding P&L, Balance Sheet, Cash Flow report, Budgets, and Margin reports contain the crucial data points business leaders must instantly understand and use to make key decisions. At the same time, customer data such as voice of customer information, buying trends, price trends, and customer archetype behaviors are also coming into the business leader’s dashboard for decision making. Business professionals without the business acumen skills and tools to apply to fundamental data analytics will be at a severe disadvantage in 2016. Understanding basic customer segments based on criteria such as demographics is no longer an entry ticket to business success. Understanding Customer Archetypes – the behaviors groups of clustered customers exhibit in certain situations and conditions – is a more important and critical business acumen skill to have in 2016. For example, think about how organizations in the healthcare industry now think about US and Global customers. The successful organizations are using skills to apply and understand archetype models to the way they think about customers. California has always been known as progressive cost cutters in healthcare. However, as managed care and the ACA evolve, California healthcare entities including the State run facilities are quickly evolving into to a quality of care / health outcomes archetype. Organizations developing business strategies using old paradigms and segmentation models to sell into California healthcare organizations could be making huge mistakes by not understanding the shift to understanding the behaviors of the new archetypes. No matter what the value proposition an organization offers to its customers, we live in a global world where there will now always be a generic, low-cost, decent-quality competitor entering the market sooner rather than later. The easiest (and laziest) reaction to a low-cost competitor entering your market is to lower prices and compete on cost. That could be okay (but probably not) if you have certain operational efficiencies and operational excellence is your value proposition. However, cutting prices and thinking you are a commodity could be business suicide if your value proposition is product leadership or customer intimacy. 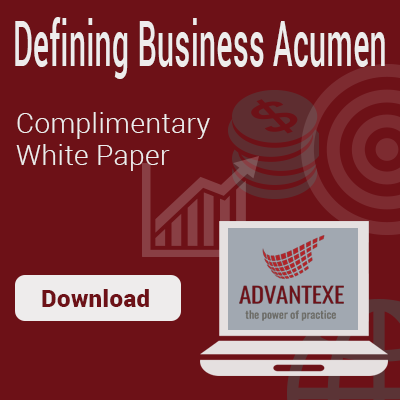 Most organizations and business leaders lack the business acumen skills to know how to deal with this critical issue. The pressure from shareholders looking for short-term gains is going to increase in 2016 and beyond. “Activist Shareholders” are becoming more aggressive (see DuPont, Dow, GE, and others for examples) and business leaders are going to be faced with making decisions that could change the course of their own careers let alone the path of the companies they work for. Having the business acumen skills to understand the drivers and the pressures activist investors are going to put on organizations will help prepare them to fight the right battles and understand the long term implications of the wrong decisions. Social media and social selling are evolving into the Social Customer Experience. The Social Customer Experience is the complete integration of an organization’s functions – marketing, sales, operations, service, manufacturing, finance, etc. – into a coordinated and aligned process of creating a customer experience. Thinking that your “Social Strategy” is just about connecting to a few people on LinkedIn, sending out a few tweets, or posting a PowerPoint presentation to Slide Share is a huge mistake in 2016 and beyond. Having the business acumen skills to set an integrated strategy to deliver your value proposition to your customers (especially in a B2B environment) over a new and expanding network of connections is going to be critical for success.